Stoke put themselves in a fine position to qualify for the Europa League knockout stage with a routine victory over Maccabi Tel-Aviv in Israel. In a drab first half, Ryan Shotton's drive was deflected on to a post and Jon Walters twice went close. Dean Whitehead opened the scoring shortly after the break with a low finish and substitute Peter Crouch sealed the win with a tap-in. Roberto Colautti headed home late on but Stoke held on for the three points. The result sees the Potters move on to 10 points, four clear of second-placed Besiktas, with two games remaining in Group E.
A point against Dynamo Kiev at the Britannia Stadium on 1 December would secure their place in the last 32. With this the second of three games in seven days for Stoke, it was hardly surprising to see nine changes from the side that started against Newcastle in the Premier League on Monday. But it was still a team that included the likes of Robert Huth, Wilson Palacios and Kenwyne Jones as Stoke looked to extend their unbeaten run in Europe to 10 matches. Huth headed wide inside two minutes, Andy Wilkinson blasted over from Shotton's cut-back and Jones was squeezed out when bearing down on goal. The hosts had not lost in 12 home European games but looked shaky at the back and bereft of attacking ideas, inviting Stoke forward for further opportunities. Shotton's low strike was deflected on to the post by Matthew Upson and an unmarked Walters headed straight at 18-year-old goalkeeper Barak Levy. Uri Cohen volleyed wide at the end of a rare Maccabi foray into opposition territory, but that was the visitors' only moment of slight concern all half. They might have taken the lead on 43 minutes when Jones flicked a long Thomas Sorensen kick into the path of Walters, only for an offside decision to rule the effort out. Maccabi would have been out of contention were it not for Stoke's profligacy, but their fortune eventually ran out as the visitors opened the scoring. Salif Diao and Wilkinson worked possession to Walters, who nudged Savo Pavicevic out of the way, allowing Whitehead to take a touch and finish low past Levy. It was no more than Stoke deserved and with Maccabi offering next to nothing in the way of a response, the lead was soon doubled. Pulis introduced Crouch for Walters and with his first touch the 6ft 7in striker tapped in Whitehead's cross after good work from Jones. Another substitute, Colautti, forced a tense finale with an excellent header from Sheran Yein's cross, but Stoke defended well to collect a deserved win. 90:00+3:44 The referee signals the end of the game. 90:00+3:23 Booking Thomas Sorensen receives a caution for time wasting. 90:00+2:13 Foul by Glenn Whelan on Moshe Lugasi, free kick awarded. Free kick crossed by Moshe Lugasi. 90:00+0:04 Shiran Yeyni provided the assist for the goal. 90:00+0:04 GOAL - Roberto Colautti:Macc Tel-Aviv 1 - 2 Stoke Roberto Colautti finds the back of the net with a headed goal from inside the area. Maccabi Tel-Aviv 1-2 Stoke. 89:23 Foul by Diego Arismendi on Moussa Konate, free kick awarded. Moshe Lugasi takes the direct free kick. 88:09 Free kick awarded for an unfair challenge on Danny Higginbotham by Roberto Colautti. Thomas Sorensen takes the free kick. Correction - 86:31 The referee blows for offside against Klemi Saban. Free kick taken by Thomas Sorensen. 86:31 The offside flag is raised against Roberto Colautti. Thomas Sorensen takes the free kick. 85:29 Foul by Omer Vered on Diego Arismendi, free kick awarded. Free kick taken by Danny Higginbotham. 85:08 Ryan Shotton challenges Klemi Saban unfairly and gives away a free kick. Klemi Saban takes the direct free kick. 82:37 Roberto Colautti takes a shot. Save by Thomas Sorensen. 81:53 The ball is sent over by Eliran Atar. 81:33 Eliran Atar takes a short corner. 76:44 Foul by Roberto Colautti on Matthew Upson, free kick awarded. Direct free kick taken by Thomas Sorensen. 76:01 Foul by Ryan Shotton on Klemi Saban, free kick awarded. Direct free kick taken by Klemi Saban. Correction - 74:33 Roberto Colautti takes a shot. Save by Thomas Sorensen. 74:33 Roberto Colautti takes a shot. Comfortable save by Thomas Sorensen. 73:00 Substitution Diego Arismendi on for Wilson Palacios. Correction - 72:11 Matthew Upson concedes a free kick for a foul on Roei Kahat. Roberto Colautti takes the direct free kick. 72:11 Foul by Matthew Upson on Roei Kahat, free kick awarded. Roberto Colautti takes the direct free kick. 71:28 The official flags Eliran Atar offside. Thomas Sorensen takes the indirect free kick. Correction - 69:39 Moussa Konate has an effort at goal. Save by Thomas Sorensen. 69:39 Moussa Konate takes a shot. Save by Thomas Sorensen. 68:36 Peter Crouch produces a right-footed shot from the edge of the box and misses to the left of the target. 68:04 Shiran Yeyni challenges Kenwyne Jones unfairly and gives away a free kick. Direct free kick taken by Thomas Sorensen. 67:29 The ball is crossed by Eliran Atar. 67:10 Omer Vered sends in a cross, Danny Higginbotham makes a clearance. 65:41 Substitution Roei Kahat comes on in place of Haris Medunjanin. 64:19 Substitution (Stoke) makes a substitution, with Glenn Whelan coming on for Salif Diao. 63:06 Assist on the goal came from Dean Whitehead. 63:06 GOAL - Peter Crouch:Macc Tel-Aviv 0 - 2 Stoke A goal is scored by Peter Crouch from close in to the bottom right corner of the goal. Maccabi Tel-Aviv 0-2 Stoke. 62:18 Haris Medunjanin is flagged offside by the assistant referee. Thomas Sorensen takes the free kick. 60:17 Substitution Peter Crouch replaces Jonathan Walters. 59:21 Substitution Roberto Colautti joins the action as a substitute, replacing Eli Zizov. 58:25 Effort on goal by Moussa Konate from long distance goes over the crossbar. 58:08 Andy Wilkinson concedes a free kick for a foul on Omer Vered. Direct free kick taken by Omer Vered. Correction - 56:15 Salif Diao gives away a free kick for an unfair challenge on Eli Zizov. Eli Zizov restarts play with the free kick. 56:15 Free kick awarded for a foul by Salif Diao on Eli Zizov. Direct free kick taken by Eli Zizov. 54:46 Moussa Konate produces a right-footed shot from close range which goes wide of the right-hand upright. 54:33 Omer Vered decides to take a short corner. 54:27 The ball is crossed by Omer Vered, Jonathan Walters gets a block in. 51:57 Eliran Atar takes a shot. Save made by Thomas Sorensen. 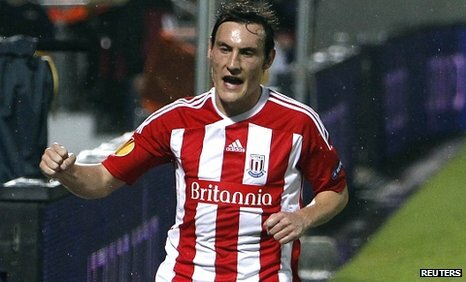 50:07 GOAL - Dean Whitehead:Macc Tel-Aviv 0 - 1 Stoke Dean Whitehead gets on the score sheet with a goal from close range to the bottom right corner of the goal. Maccabi Tel-Aviv 0-1 Stoke. 49:57 Salif Diao has an effort at goal from 20 yards. Roberto Puncec gets a block in. 49:25 Unfair challenge on Wilson Palacios by Roberto Puncec results in a free kick. Danny Higginbotham takes the free kick. 46:49 Dean Whitehead takes a outswinging corner from the right by-line to the near post, Shiran Yeyni makes a clearance. 46:00 Eliran Atar is ruled offside. Thomas Sorensen takes the indirect free kick. 45:31 Dean Whitehead concedes a free kick for a foul on Eli Zizov. Free kick taken by Eli Zizov. 45:01 Substitution Uri Cohen goes off and Omer Vered comes on. 45:00+0:10 The referee blows for half time. 44:00 Inswinging corner taken by Eli Zizov from the left by-line, clearance made by Matthew Upson. 43:22 Uri Cohen delivers the ball, clearance made by Andy Wilkinson. 42:56 Salif Diao concedes a free kick for a foul on Eli Zizov. Moshe Lugasi restarts play with the free kick. 42:21 The official flags Jonathan Walters offside. Free kick taken by Klemi Saban. 41:47 Jonathan Walters produces a cross. 40:37 Eli Zizov has an effort at goal from just outside the box which goes wide of the left-hand upright. 36:55 Shot from 25 yards from Moshe Lugasi. Blocked by Matthew Upson. Haris Medunjanin takes the inswinging corner, Shiran Yeyni produces a left-footed shot from the edge of the box and misses to the left of the target. 35:41 Barak Levy restarts play with the free kick. 35:41 Booking Booking for Kenwyne Jones. 35:35 Foul by Kenwyne Jones on Savo Pavicevic, free kick awarded. 33:49 Moshe Lugasi is penalised for handball and concedes a free kick. Centre by Dean Whitehead, Jonathan Walters takes a shot. Barak Levy makes a save. 32:36 Dean Whitehead takes the direct free kick. 32:36 Booking Roberto Puncec booked. 32:36 Roberto Puncec concedes a free kick for a foul on Jonathan Walters. Correction - 31:37 Danny Higginbotham has an effort at goal from the just inside the area hitting the post. 31:37 Ryan Shotton takes a shot from a just insdie the penalty box and strikes the post. 30:40 Outswinging corner taken from the right by-line by Dean Whitehead, Barak Levy makes a save. 29:49 The ball is sent over by Uri Cohen, Robert Huth gets a block in. Correction - 28:34 Moshe Lugasi takes a shot. Blocked by Danny Higginbotham. 28:34 Ryan Shotton takes a shot. Blocked by Savo Pavicevic. 26:50 Free kick awarded for an unfair challenge on Eli Zizov by Ryan Shotton. Centre by Haris Medunjanin, Shiran Yeyni takes a shot. Save made by Thomas Sorensen. 25:37 Eliran Atar takes a shot. Blocked by Matthew Upson. 20:48 Dean Whitehead takes a outswinging corner. 20:35 Kenwyne Jones takes a shot. Blocked by Savo Pavicevic. 19:41 Unfair challenge on Danny Higginbotham by Eliran Atar results in a free kick. Free kick taken by Thomas Sorensen. Correction - 18:08 Corner taken right-footed by Dean Whitehead, Savo Pavicevic manages to make a clearance. 18:08 Corner taken by Dean Whitehead, Shiran Yeyni makes a clearance. 17:05 Eliran Atar gives away a free kick for an unfair challenge on Matthew Upson. Direct free kick taken by Thomas Sorensen. 15:45 Handball decision goes against Jonathan Walters. Moshe Lugasi takes the free kick. Correction - 14:15 Ryan Shotton produces a cross, Effort from outside the area by Andy Wilkinson goes wide right of the goal. 14:15 The ball is delivered by Ryan Shotton, Effort from outside the area by Andy Wilkinson goes wide right of the goal. 13:36 Uri Cohen sends in a cross. 12:18 Danny Higginbotham takes the free kick. 12:18 Booking Uri Cohen booked. 12:09 Foul by Uri Cohen on Ryan Shotton, free kick awarded. Correction - 11:29 Jonathan Walters has an effort at goal from the edge of the area that misses to the right of the target. 11:29 Shot on goal by Jonathan Walters from just inside the area clears the crossbar. 11:19 Ryan Shotton produces a cross. Correction - 7:58 Moussa Konate has an effort at goal from outside the penalty box missing to the wide right of the target. 7:58 Moussa Konate takes a shot. Save made by Thomas Sorensen. 7:02 Moussa Konate delivers the ball, save by Thomas Sorensen. 5:27 Wilson Palacios concedes a free kick for a foul on Eli Zizov. Direct free kick taken by Moshe Lugasi. 2:42 Savo Pavicevic concedes a free kick for a foul on Dean Whitehead. Direct free kick taken by Danny Higginbotham. 0:42 Outswinging corner taken by Dean Whitehead from the right by-line, Robert Huth produces a header from inside the area that goes over the bar.